Some months ago I was talking about the pitfals of removing signatures in this post. I have pretty much pointed out why it is important to check, double-check, and triple-check before even thinking about having a mei removed so this time I want to introduce a different, recent and documented example of why signatures were removed, and thanks Darcy for bringing that very issue to my attention. It is about a sunnobi-tantô by the famous Sôshû master Hiromitsu (広光). Today, there are roughly 20 dated works of this smiths extant that have been authentificated. Now one of these works, a tantô signed “Sagami no Kuni-jûnin Hiromitsu” (相模国住人広光) and dated “Enbun sannen jûchigatsu hi” (延文三年十一月日, “a day in the eleventh month Enbun three ”) was designatged as a jûyô-bijutsuhin on December 18 1935 (see picture 1). Back then, it was owned by Count Sakai Tadatae (酒井忠克, 1883-1939), the grandson of the last Sakai daimyô of the Obama fief of Wakasa province. Anyway, the blade is now designated as a tokubetsu-jûyô (in 2008, it got jûyô the year before, with the shu-mei already on, so the shu-mei must have been added some time in between) and luckily, that context of the theft is recorded in the jûyô-tôken nado zufu explanation. And considering how much actually was recorded in the past its a miracle we have so much references – and how much is being stored nowadays online. Where it hopefully won’t ever disappear. Markus, if the mei was ground off how was it replaced officially and to NBTHK standards? Is there a process for repair of mei? Hi Carson, the mei was not “physically replaced” but a shu-mei, a red-lacquer inscription, was added which copied the original, the chiseled signature. But there is no process of repairing a (lost or damaged) mei per se. 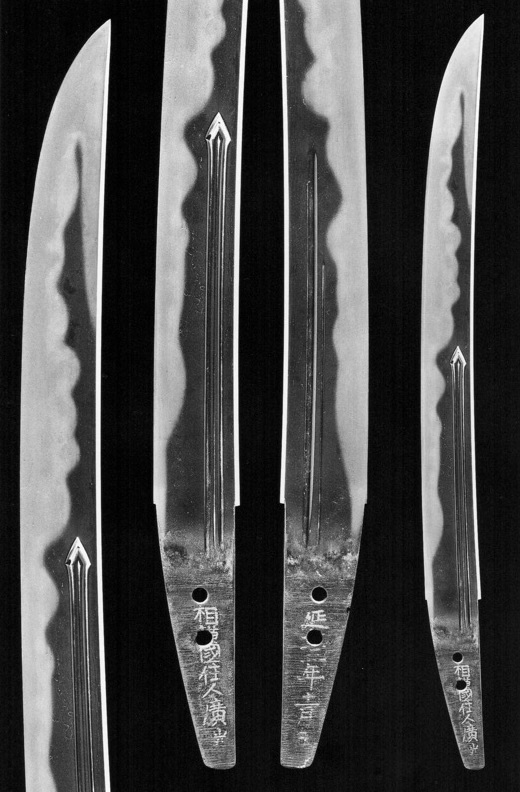 It amazes me how often in the past blades have been defaced by polishing over bonji and blade carvings. It’s so sad when part of it’s history is destroyed.